I never really understood how powerful until this week. For you to understand the depths of that statement, we need to go back a few years. I don’t know when and I don’t know how, but somewhere in my childhood I gave my voice away. Think of it in terms of The Little Mermaid. (This will connect later, I promise!) You know how Ariel decided she wanted Prince Eric? How she would do anything to have him? Pay any price? How she sold her voice for a pair of legs and hope? I did that too. But my prince took the slippery, evasive form of acceptance. I used to live everyday terrified people would get to know the real me and hate me. So I shut up. I gave up my voice and kept my opinions, my beliefs, my wants and needs to myself. I remember sitting in the school library, it must have been my sophomore year of high school. A classmate and I were working on an assignment for English. I don’t remember the exact subject, but I know it hit some personal issues. As I shared, my eyes refused to stop watering. Not because I dredged up some buried sorrow, but because I was terrified she would reject me. This response plagued me well into adulthood. Fast forward more than a decade, when I realized giving up my voice no longer serve me well. I was dying on the inside. It erupted in fits of anger, being overwhelmed, and constant choking sensations. Randomly, a friend of mine had a vision of me as The Little Mermaid. (See it connects.) He told me, “Her natural environment is the water and under the sea.” He talked about her fiery red hair and the power of her voice. At the time, I didn’t think much of it, but the image stuck with me. A year or more later, at a children’s ministry conference the speaker said God gave her a new name. Who doesn’t want a pet name from God??? Immediately, I asked for one. I heard it, saw the letters form in my mind. But what did it mean? I whipped out my phone in the middle of the service and googled it. I couldn’t even file it. I felt nothing like a roaring lion, more like a skittish sheep. Later, another friend connected Ariellah with Ariel. Can we say stunned? For those of you not born in the late 70s/early 80s and Disney obssessed, in the Disney version, the Little Mermaid’s name is Ariel. Like a slap in the face, I knew I couldn’t be quiet anymore. I keep it tacked to a bulletin board above my writing desk. It took me years of courage to get my voice back. I’ve had it intact for a while now, but until this last week, I never understood how powerful my voice really was. People keep telling me how much my daily braveness inspires them. Some have been brave because I’ve been brave. Others have shared their fear over being brave. It floors me. I started Acts of Bravery for me, for my own growth, and somehow me being brave helps others be brave? Guess what? That acceptance I paid for with my voice? It’s not a fair barter. The more I paid with quiet, the more the real me shut down, and the more I felt like I didn’t belong. The only way to be settled on the inside was to accept myself. But I need my voice for that. The more I speak up, the easier it gets and the more of myself I get back. If my voice is powerful, yours is too. Imagine how much better the world would be if we all spoke up–for ourselves, for love, for those who can’t. We would transform not only ourselves, but the world! Tell me! What do you have to say? I want to know every brave thing you spoke out this week and how it transformed your world. Do You Suffer From Save the World Complex? This is so good Rachelle! You are an excellent writer! So proud of where you’ve ended up… Not just as an author BUT as a brave person loving yourself and others! 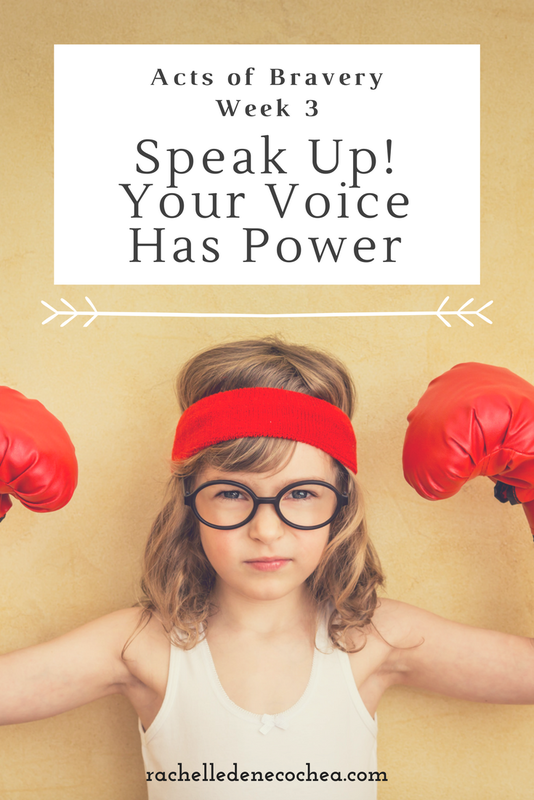 Finding our voice can be soooo hard but years ago I decided it was harder for me to not use it. Yep… Not everyone will be happy but they will know Me (the real me) and I’ve learned to value that! Keep being brave and encouraging others! Blessings!! Love this, Beth! I second that insight that it’s harder not to use our voices than it is to keep quiet. So glad to hear from you.